Alors si toi aussi tu veux soutenir notre cause, marquer ton appartenance aux princes de l'ombre et avoir le swag les soirs de pleines lune. Achète le, en plus on t'offre un fanzine à lire en attendant que le soleil se couche. 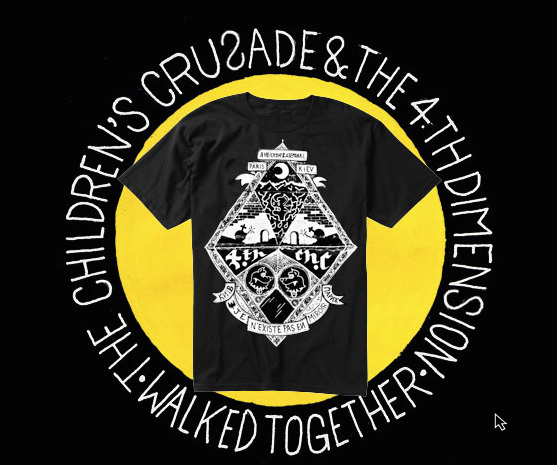 The 4th Dimension as well as The Children's Cruzade have many common points, one of them is cultivating the secret desire for a worldwide take-over, in a way like the respectable Dracula, Count of the Carpathian. Not an easy task I must say, but we started by taking possession of a wall in Kiev to seal our union, and followed a t-shirt. So if you aspire to be a nocturnal prince too, targeting a global conquest, just grab one via paypal and you will receive an additional fanzine to read, while waiting for the sun to set.